To marinate duck leg, finely chop all herbs and finely dice garlic. Mix in peppercorns and sea salt with combined herbs and garlic. Add duck legs to the mixture and allow to marinate for at least 24 hours. After period has lapsed, wash herb salt mix from duck legs. Arrange duck legs in large roasting tray and cover with duck fat ensuring that legs are completely covered. Place roasting tray in oven for approx 3-4 hours on 100 degrees Celsius. 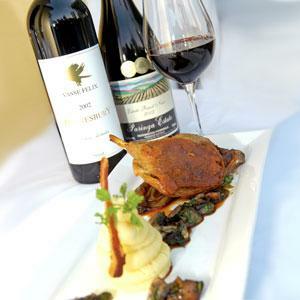 Duck legs are cooked when meat can be easily released from the bone. Allow to cool inside duck fat. 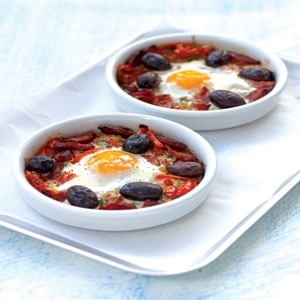 Increase oven temperature to 240 degrees Celsius and remove duck legs from fat. To cook dish, position each leg skin side down onto a roasting pan under high heat for 15 minutes and this will ensure that skin becomes crispy. 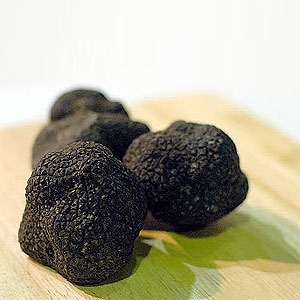 To serve, accompany with truffle scented mashed potato, caramelised baby witlof hearts, sautéed wood mushrooms and pan juices. 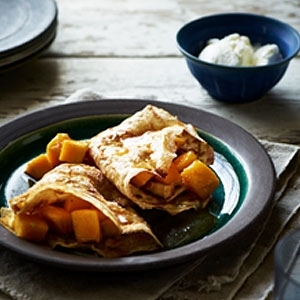 A delicious mixture of warm crepes and fresh, sweet mango with a little kick.